Categories: Always Be Dancing, Always Be Dancing Mindful Movement, arts education, dance, dancing, Flamenco, performing arts, spanish dance, Spanish music, world music | Tags: ArtWeek Boston, authentic, Cambridge MA, chef, dance, delicious, Flamenco, guitar, music, paella, performance, social, spanish, spanish dance, Spanish music, spanish song, tapas, wine, zarzuela | Permalink. Time: 7:00 pm, cocktail hour with appetizers and 8:00 pm approx. entertainment will begin. I will be dancing Alegrías accompanied by Anthony “Tiriti” Tran on guitar. Location: 12 Highland Street. Delbridge Center for the Performing Arts at the Walnut Hill School. This fundraiser supports all the great cultural offerings we provide free to the public each year. If you want more info. about us please visit our website: www.natickcenter.org. Tickets are $60 per person and $75 at the door. Categories: Always Be Dancing, Always Be Dancing Mindful Movement, dance, dancing, Eve Costarelli, Flamenco, performing arts | Tags: accapella, cultural, culture, dance, diversity, entertainment, Flamenco, fundraiser, irish dance, kathak, metrowest ma, Natick, performance | Permalink. ¡Olé Namaste! Infuses the movements, breathwork and meditation of yoga with the music and dance of flamenco. This workshop is fully accessible and can be done in a chair or standing and affords participants the opportunity to explore and experience the joy of movement and expression of two arts within a supportive, creative environment, regardless of experience and/or abilities. $20 pre-registered or $25 at the door. We will start on mats (or chairs if needed) and move on to dance. Participants may wear hard bottomed shoes or sneakers for the dancing. Workshop will be held in Edwards Hall at Open Spirit. 39 Edwards Street, Framingham, MA. Categories: accessible dance, Always Be Dancing, Always Be Dancing Mindful Movement, arts, Birth of Flamenco, dance, Eve Costarelli, Flamenco, Massachusetts, Mindfulness, ole namaste, open spirit, performing arts, yoga | Tags: Accessible, Art, chakras, dance, dancing, diversity, expressive art, Flamenco, inclusive, Mindfulness, music, ole, Ole Namaste, spanish, yoga | Permalink. Boston Voyager Magazine: Today we’d like to introduce you to Eve Costarelli. I grew up in a beautiful yellow brick Victorian in Brookline, MA. Our home was an artist’s home, filled with the artwork of my mother Amelia Robin, a paper sculptor, ceramic artist and water-colorist extraordinaire plus our childhood art and countless other pieces of art covered and filled every space. Although not encouraged at first to do so, it felt natural for me to follow my mother into the arts, although it took me years to discover my form of expression. I always loved to dance and mover, yet I never attended dance classes as a child instead I spent every Saturday from 9AM-4PM taking art classes at the Museum of Fine Arts and attending classical music concerts, operas and theater. But I never stopped moving. I filled every waking moment with energy. I learned to dance by watching Soul train on Saturday mornings; was stopped on the dance floor and told I was the best dancer ever; I became the Go-Go dancer for Manray, the alternative nightclub in Central Square, Cambridge, MA but my first foray into dance classes didn’t come until after college when my mother decided I should learn to tap dance. She bought me some tap shoes and paid for classes. My luck to stumble in Leon Collin’s Tap dancers Paradise. I was hooked. Tap dance became my it. My mom then compelled me to go to Harvard Summer Dance Program to study choreography and through a woman I met there, I discovered flamenco. Flamenco became my it. After having my son, I found yoga. And keeping up with my MO, Yoga became my it. This self-focused exploration is truly my passion. Through yoga I was opened to new motivations as a dancer, yogi and educator. I use flamenco and yoga as mindful moment forms from which EveryBody can access their true nature to reveal to them their inner strength, determination and courage. One of the most difficult parts of my career has been maintaining enough students and external projects to make a living. It is hard to make art a profession, because there is no one’s steps you can follow in. No job that is already created for you to step into. No promise that your art will pay your bills. Being an artist has meant for me forging a new path and then creating the opportunities in which I have been able to hone my skills, create my art and learn, learn, learn. I have had the absolute joy of spending over 20 years bring dance to the Boston the community but I have had a lot of sleepless nights stressing over creating the right balance of my art as a career and as a creative expression. Alright – so let’s talk business. Tell us about Always Be Dancing: Yoga & Flamenco for Everybody – what should we know? There are three main aspects to what I do and then a whole lot on the periphery. Secondly, through my collaboration with Hoops and Homework, an after-school program for some of the neediest youth in Framingham. I go to their two sites weekly to bring yoga, mindfulness and the arts to these kids who would not normally have access to them and I have developed a training manual to accompany my programming that I hope to get published soon. That’s not all. Thirdly is my all-inclusive flamenco dance program ¡Olé Flamenco! 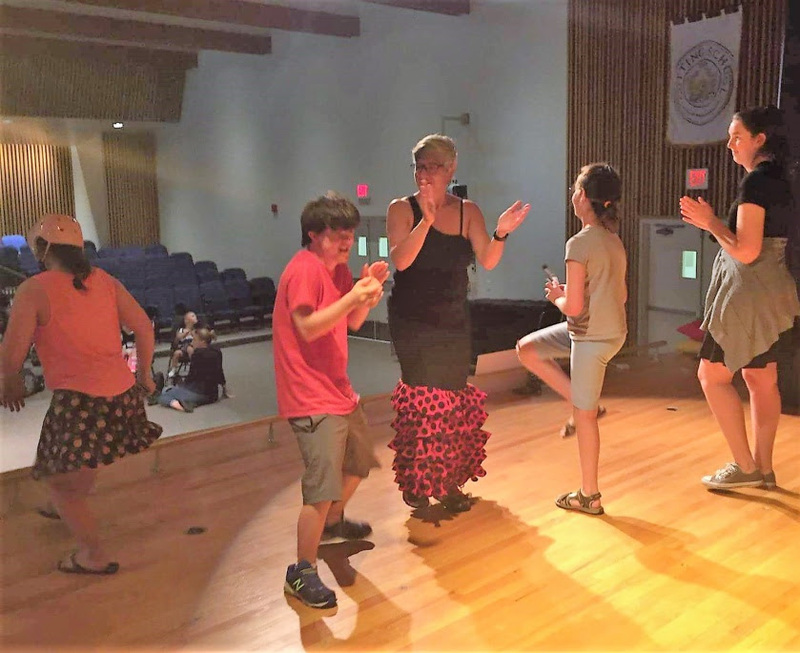 which brings flamenco to youth without access or with limited access to the arts, including underprivileged populations, ASD, SPD, Orthopedic Impairment and developmental and Intellectual disabilities. I use flamenco to stimulate the whole child by using movement and expression as access points for a healthy, safe, engaging, supportive, and challenging environment. This type of learning exposes children to the creation of art forms, cultivates self-expression (whether of an individual or a collective) and demonstrates a successful mixing of diverse populations-lesson which are relevant for youth in today’s society. And one last thing…I am a budding author. I started writing book reviews about 5 years ago to hone my writing skills in preparation to write several children’s books. I hope to make a good query, get an agent and be on my way to become a celebrated author! One must always have dreams and keep on learning. Be your own soul’s light. Well it is teacher appreciation week 2018, so here goes: my tap dance teachers at Leon Collins: Julia Boynton, Josh Hilberman, Jimmy “Sir Slyde” Mitchell, Diane Walker & Sue Ronson, who believed in my ability and my vision as a dancer. My flamenco teachers: Ramon de los Reyes, Omayra Amaya & more recently, La Lupi, for opening up the secrets to flamenco for me; for my yoga teachers Barbara Benagh, Elizabeth Goranson and Guruatma Ji, in their own special ways, helping me discover me and allowing me to find my true voice. And most recently, Debbie Clark & Rosanne Kates from Open Spirit Center for helping to open doors for me; through them I connected with Herb Chasen & Pam Kaufman of Hoops & Homework and also Cheryl Aglio-Girelli & Mynette Shifman, the teen health nurses at Framingham High School. My husband, Rob Costarelli, IFBB Pro Bodybuilder, has been behind me 100% since day one-we are truly a power couple! My son, Anthony, my brothers Andrew & William and countless of families who have entrusted me with their children over the years. My “girls”…I have never lacked form cheerleaders and believers. Categories: Adamant Eve, Always Be Dancing, Always Be Dancing Mindful Movement, dance, Flamenco, Interview, Massachusetts, Mindfulness, performing arts, Special Needs, yoga | Tags: Accessible, accessible dance, accessible flamenco, children, everybody, inclusion, inclusive community, kids, teens, youth | Permalink. Categories: Always Be Dancing Mindful Movement, arts, arts education, Book Review, children, Childrens Flamenco, dance, Dance Classes, Dance Instruction, dancing, Education, Emotional Intelligence, Flamenco, healthy, kids flamenco, Massachusetts, Mindfulness, ole namaste, performing arts, spanish dance, special education, Special Needs, teen flamenco, youth flamenco | Tags: Art, book, books, children, dance, fiction, Flamenco, kids, non-fiction, reviews, Spain, stories, story, travel | Permalink.